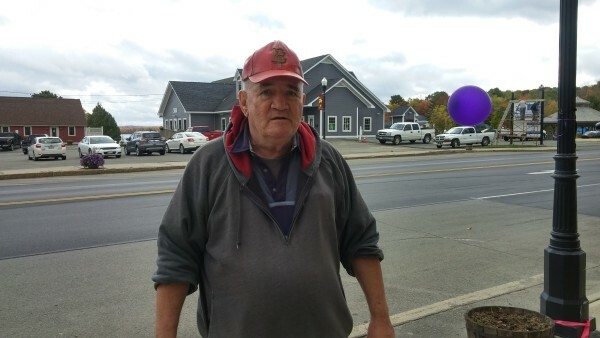 Joel Parker of Fairfield, who works in Skowhegan, said he usually votes Republican but is unsure whether he can vote for Donald Trump for president because he is concerned about what message Trump's election would send to the rest of the world. Skowhegan is among 2nd Congressional District towns that find themselves in the national spotlight this year because they are battlegrounds in the presidential race. Anti-Hillary Clinton signs adorn a downtown shopfront in Dover-Foxcroft at the same building where the county Democrats have an office. Dover-Foxcroft and other towns in Maine's 2nd Congressional District are under a spotlight this year as political battlegrounds in the presidential and congressional races. That East Millinocket is a battleground town in Maine's 2nd Congressional District is evident in the shadow of the now-shuttered Great Northern paper mill, which employed generations of Mainers prior to its closure. Jim Deacon of Lincoln said he can't vote for Donald Trump for president because "he's a dangerous man." Lincoln and other towns in the 2nd Congressional District are in the spotlight this year as battlegrounds in the presidential and congressional elections. 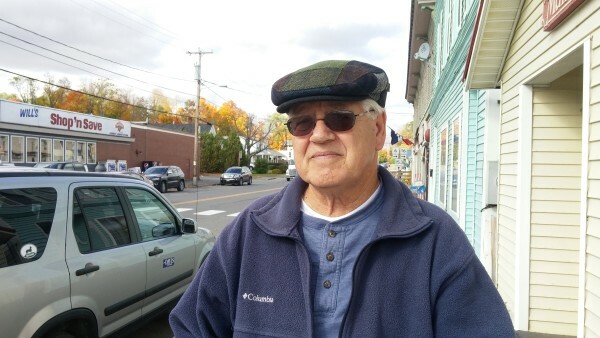 Ron Soucy of Dover-Foxcroft explains why he will vote for Democrat Hillary Clinton in the Nov. 8 election. 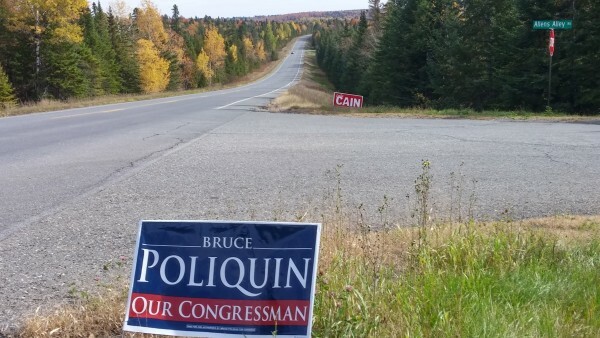 The battleground campaign between Bruce Poliquin and Emily Cain for Maine's 2nd Congressional District seat plays out quietly on a lonely stretch of Route 164 in the Aroostook County town of Stockholm. FORT KENT, Maine — In rural northern Maine, October is usually dominated by the potato harvest, but 2016 has created a new reality for the people scratching out livelihoods in the 2nd Congressional District: Life in a national political battleground. They’ve been told that voters in the 2nd District could make history this year by splitting with southern Maine in the presidential election. For the first time ever, they could divide Maine’s four electoral votes between two major-party candidates, and a few predictive scenarios have pegged the district as the potential tiebreaker in an Electoral College stalemate. Adding to the district’s political import is the fact that a rematch between incumbent Republican U.S. Rep. Bruce Poliquin and Democratic challenger Emily Cain could affect the balance of power in Congress. Presidential campaigns have devoted unprecedented resources to courting voters in the 2nd District, where polls show Republican nominee Donald Trump leading Democrat Hillary Clinton. Trump will make his second visit to the district Saturday, when he holds a 3 p.m. rally at the Cross Insurance Center in Bangor. Clinton has sent a stream of surrogates, including her daughter Chelsea on Thursday. Away from the political arena, 2nd District voters express dire concerns about the country’s direction but harbor doubts that either candidate can correct national problems that make their lives more difficult. They see signs of economic decay in northern Maine’s moribund manufacturing sector and bemoan trade imbalances that make them worry that they will be the ones to call it quits on family farms and ways of life that have sustained the region for generations. With increasing focus on each candidate’s purported character flaws, there’s a sense of resignation and detachment. Campaign workers badger them with sales pitches that emphasize the importance of each vote in this election, but many 2nd District voters wonder whether the political system and who sits in the White House have become irrelevant to their daily lives. The typical autumnal quiet has been replaced by phones ringing throughout the evenings with voices from afar — a lot of people say they just don’t answer when they don’t recognize the number — and their mailboxes are full with variations of the same message: Their votes are crucial to the future of our country. With the paper mills faltering and the potato farms having trouble finding buyers for their product, many view the presidential campaign with a streak of melancholy and an internal question: Does it really matter who the president is? James Fortin was born in Fort Kent but moved to Connecticut in 1957 for a career as a tradesman. He retired to his hometown a decade ago, returning to find empty storefronts, shuttered mills and a marked increase in economic suffering. For the uninitiated, trucks lumbering by every few minutes with seemingly impossible amounts of potatoes and train cars packed with pulpwood to be shipped to mills in Canada look like the makings of a hearty economy, but the people here know that’s not the case. The potato fields are all owned by a handful of corporations, the border crossing in Houlton is busy with spuds coming in from Canada and the price paid for timber keeps falling. Canadian industries enjoy government subsidies that just don’t exist in Maine. It’s a truth that’s as enduring as the rolling hills on Routes 1 and 161 between Houlton and Fort Kent, where every now and then drivers rise just high enough to see the world around them for hundreds of miles in every direction. For the most part, though, they see their only their local reality: thousands of acres of potato fields and on some of the ridges lines of wind turbines. To some, however, the identity of the next president matters a lot. Julie Guglielmo is a young mother from Frenchville who has five children, age 7 and younger. She was at the Fort Kent McDonald’s with one of them this week for a quick breakfast. The presidential litmus test for her centers on abortion, which she opposes. She has other reasons to care who becomes president: She wants religious freedom, the ability to parent her children how she wants, the flexibility to home-school them, the power to decide whether they’re vaccinated and what they’ll be taught in their lessons. 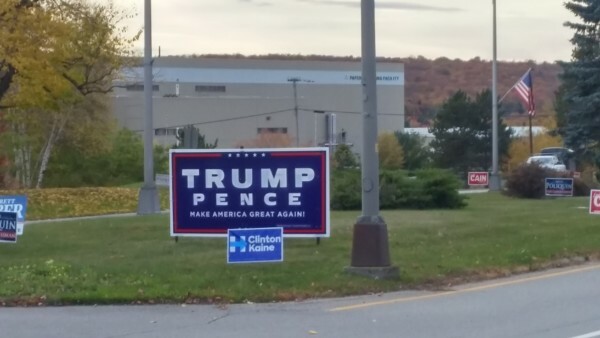 Down the road a piece in Presque Isle, retired municipal employee James Kaiser, a Trump supporter, said the president matters on taxes and picking U.S. Supreme Court justices. There’s not been enough focus on those issues in a campaign that Kaiser and numerous others told the Bangor Daily News is “disgusting.” While some are repulsed by Trump’s lewd comments or Clinton’s handling of emails while she was secretary of state, Kaiser said the media and in turn voters are missing the point. Marion Gilman, retired from the University of Maine at Presque Isle, has spent her life farther south in Mars Hill. She gestures to the Bigrock Ski Area and its slopes, where a string of wind turbines can now be seen from downtown, as the fondest memory of her childhood. Gilman is active in the local Republican committee and has sent a donation to Trump. But on Tuesday, she was deeply disturbed by the chasm that had grown between Trump and Republican House Speaker Paul Ryan of Wisconsin. Why vote Republican? For Gilman it’s about preserving the way she’s always lived her life. “Up here, we believe in everyone working and in paying our own way and not getting anything for free,” she said. In Millinocket, where the paper mills are closed but the tourism industry has new hope after Democratic President Barack Obama designated a new national monument nearby, the owner of the downtown Blue Ox Saloon, Tom St. John, is trying to hold on for another couple of years, when he figures his tables will fill with an influx of park visitors. He’s voting for Trump, basically because he thinks the billionaire businessman deserves a chance to fulfill his “make America great again” motto. Lincoln is another town struck by a mill closure. Like elsewhere, it’s a Republican-leaning town but there are Democrats, such as Jim Deacon. He said the memory of Bill Clinton balancing the federal budget gives him hope for Hillary. He dismisses controversies about her handling of emails while she was secretary of state. 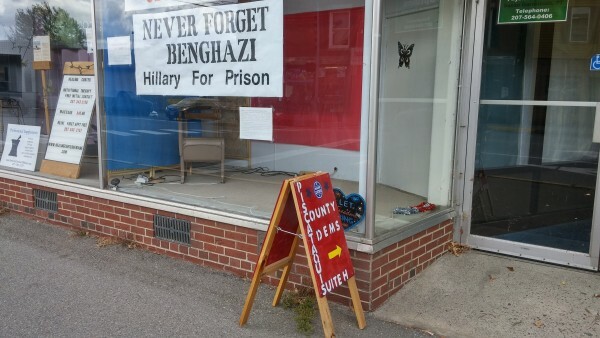 Ron Soucy in Dover-Foxcroft agreed that the emails and furor around the 2012 attack on the U.S. consulate in Benghazi, Libya, are nothing more than campaign-season constructs. 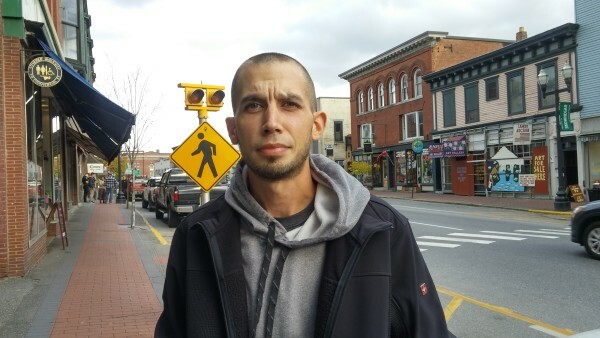 Joel Parker of Fairfield is a personal care worker in Skowhegan. He said he’s undecided who he’ll vote for but that his thoughts swirl around what this campaign is saying to the rest of the world. “It all reflects on our country,” he said. Wanda Collins, a retiree, said Trump disgusts her and Clinton is a liar but that she too worried about America’s place in the world. Correction: An earlier version of this story incorrectly identified the monetary exchange between the Canadian and American dollars.